ROX Stardrop Rose Gold Plate & White Topaz Necklace WAS £110 (85% OFF) - £16 + Free Delivery & Gift Wrapped & 5% QUIDCO Cash Back!! 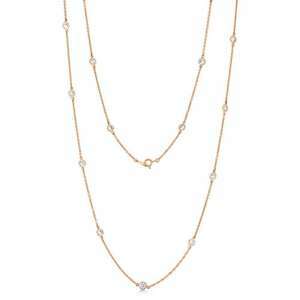 Stardrop White Topaz Rose Gold Plate Necklace. Part of our new Stardrop collection this rose gold plated 925 sterling silver necklace features many dazzling white topaz rubover set stones. Measuring 90cm in length with a 5cm adjuster complete with ROX tag and lobster clasp. Perfect worn on its own or with the matching Stardrop earrings and bracelets. Complete with beautiful branded ROX packaging.